Menorca has its fair share of fiestas that are ceremonial, religious, traditional and fun. 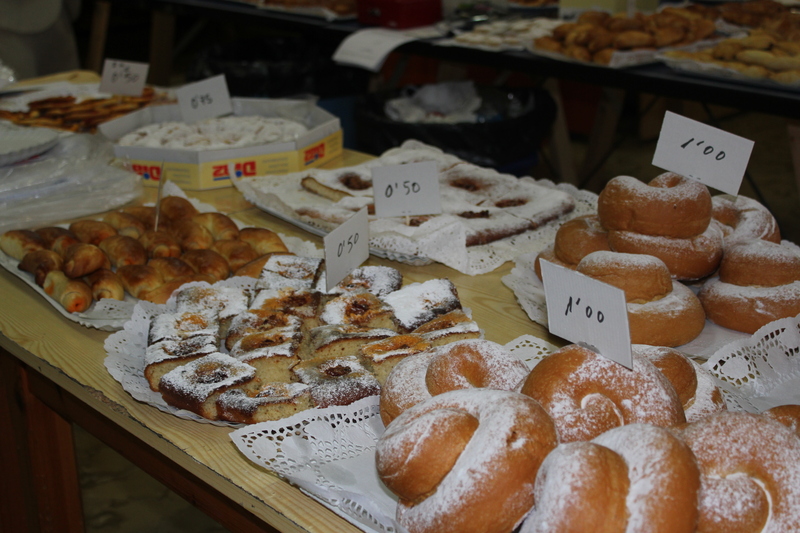 Spain is known for its fiestas, and whilst there is not a day that goes by throughout the year without a local fiesta in one town or another, Menorca also has its fair share of fiesta fun too. ‘Fiesta’ is used to describe all kinds of public holidays and also celebrated feast days of relevant saints and patrons of each town. In the height of Spring, May is the month where every weekend both Saturday and Sunday many children make their first Communion. 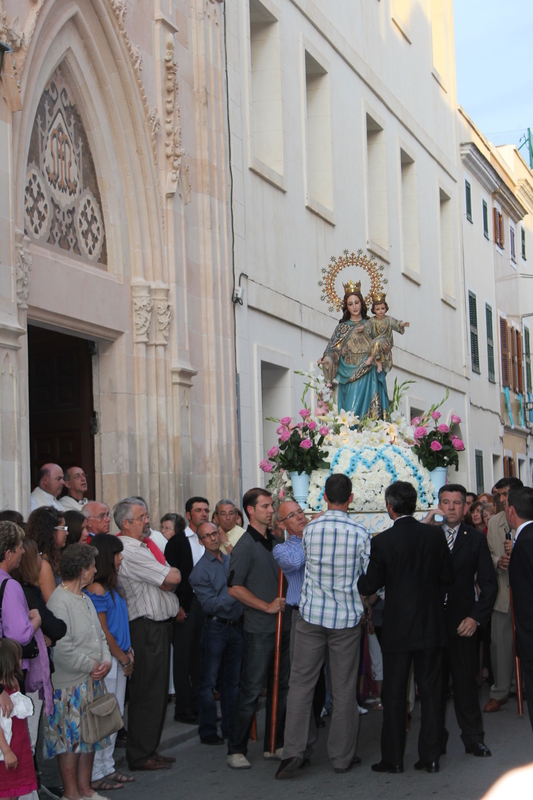 It is also the month that Ciutadella celebrates its patron saint Mary known locally as Maria Auxiliadora. Whilst the actual feast day is 24th May, the traditional procession to celebrate this event is held on the last weekend of the month. One of the attractive churches of the town, named after the patron saint, holds an evening mass on Sunday. 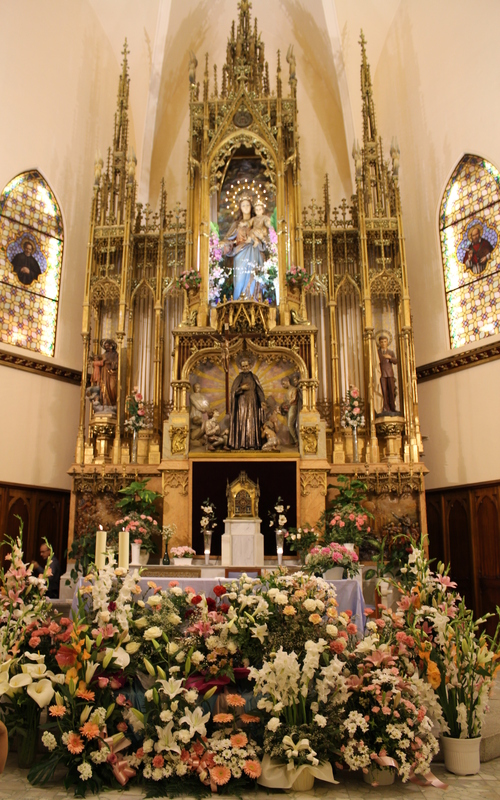 All the children who have made their first communion dress in their communion dresses and suits once more and after mass parade around town with the majestic statue of Maria Auxiliadora dressed in a selection of spring flowers. 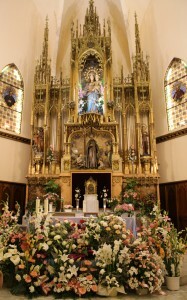 The church also is decorated lavishly in flowers of all kinds, a breathtaking sight not to mention a delightful perfume. A lovely little town tradition which celebrates both the ‘patron del pueblo‘ and this special milestone for the children. The townspeople hang colourful flags adorned with the image of Maria Auxiliadora from their windows the streets are filled for with collapsible wooden framed chairs known as ‘Coca Rossas.’ This is a sign of summer approaching where townspeople invite their friends to sit outside their front doors and watch the parade go by whilst sharing some local delicacies. As an end to the celebration there is live street music and the famous ’Jaleo’, the music of Sant Joan is played for the first time each year. A tune that easily gets stuck in your head and your heart. The countdown to Sant Joan, the biggest fiesta of the year on the island has begun. 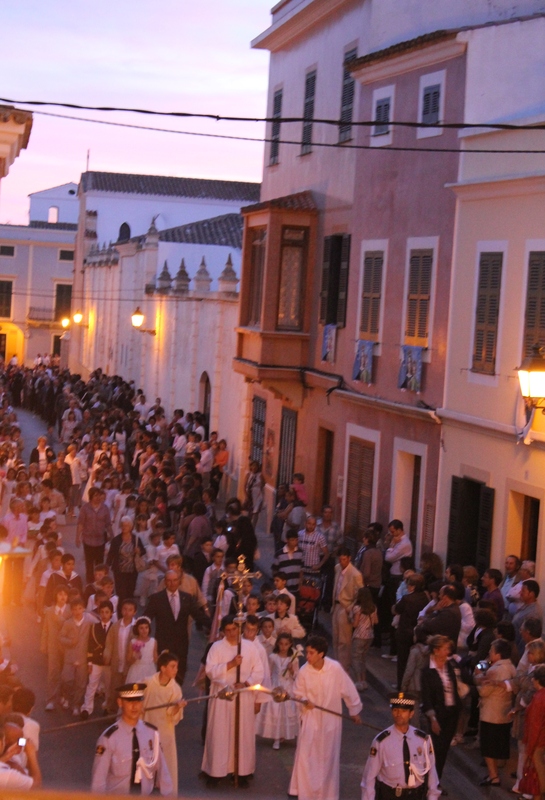 The summer season of town fiestas follow thereafter held each month from June to September all around Menorca. The fiestas are what make summer so unique in Menorca. Whilst spoilt for choice here with beautiful beaches and delicious food, it’s the towns’ traditional fiestas with their protagonists of the purebred Menorcan Stallions that are the heart of this little island.